Patrick is a personal trainer that specializes in long-term weight loss and body transformation using a balanced approach of nutrition and exercise! I believe in sticking to 4 principles for long term weight maintenance and health: Adequate sleep, water, exercise, and whole foods. 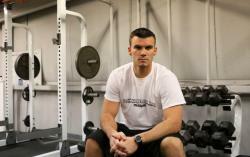 Patrick Mullin is a Certified Personal Trainer and Certified Nutrition Coach from Atlantic City, NJ. His personal training programs have helped dozens of adults, young and old, achieve admirable weight loss totals. Including one person over 100lbs of total weight loss. He has been featured in The Press of Atlantic City for his fitness knowledge. Contact him today to start training!